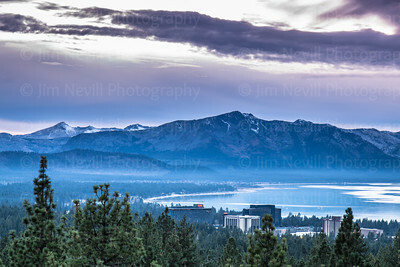 Lake Tahoe is of course known for its blue waters, snowy ski slopes and surrounding mountains. I've spent many years exploring this region with my kids, friends and all by my lonesome. It's almost laughable how pretty this area is, in every season it boasts A+ nature, adventure opportunity and wild beauty. 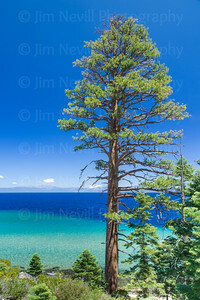 In this gallery are photographs taken around Lake Tahoe Basin, CA. 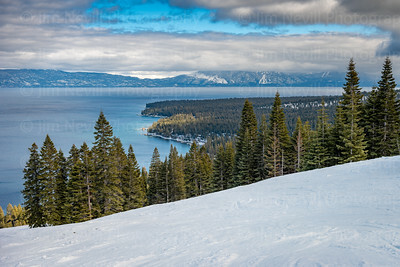 \Tahoe is a year round destination, and obviously in wintertime it offers world class skiing and boarding. If you take your family to the mountains mid week, you often feel like you have the place to yourself. Last week we took our kids skiing and there were 200 total lift tickets sold - wide open beauty. 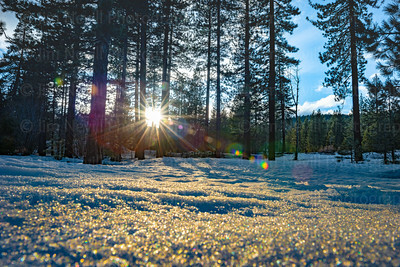 Taken on December 23, 2013 this sunset moment was very unique. 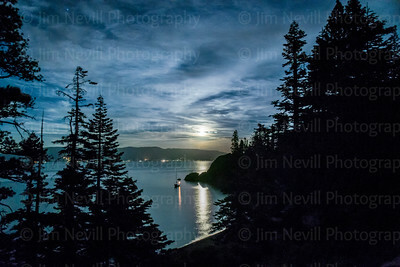 The afterglow effect produced by this early winter sunset provided enough ambient light to take a highly detailed wide angle photo where even the distant mooring buoys are in sharp focus. 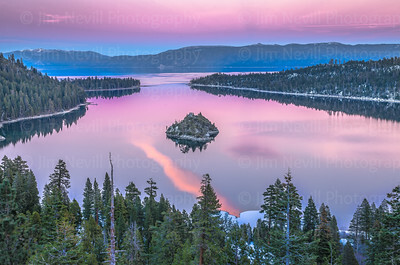 The singular lightning bolt shaped cloud reflection in front of Fannette Island along with the light snow dusting, glassy lake conditions and incredibly purple hue made for the perfect storm of photographic opportunity. It really is that blue. It's Caribbean blue and my son and I paddled to this west shore cove and found this awesome blue lagoon. Pine scent strong in the air, warn breeze, solitary sailboat off in the distance, backdropped by Mount Rose - Lake Tahoe, Summer 2016. A random find along the banks of the Lake Tahoe. 2:1 Panoramic of a group of kids best impression of an Andy Goldsworthy sculpture. 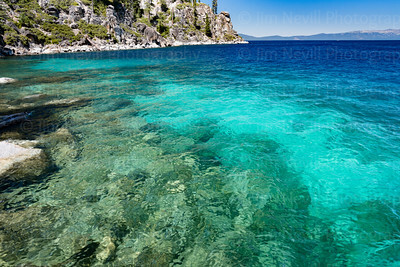 Lake Tahoe, raw and in its happy place. Multiple times throughout the trip my family and I just returned from we thought, "Where are we? Back on Maui? In the Bahamas? Indonesia perhaps?" Nope, we were in the Sierra Nevada on the magnificent Lake Tahoe. 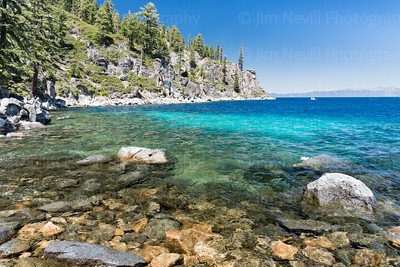 Lake Tahoe, CA. I took this photo with an ultra wide angle, 12mm Sigma lens hoping to include as much as my eye was experiencing in the composition. The lake was surprising devoid of boats, kayaks, SUP's or any version of craft due to some distant thunder hat scared everyone away,. Those afternoon Sierra storms vary from furious to bluffing and on this night, not a drop of rain fell. I was perched on a rock outcropping enjoying the rare solitude. In Summer 2015 I attended an entrepreneurs conference in Lake Tahoe. Among the speakers were 4 Olympic Gold Medalists, Hollywood actor Glen Morshower, money expert Loral Langemeier and many others. It's important to network with peers, be inspired and set some new goals every year. 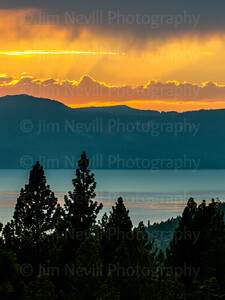 Although I've been stuck indoors for the most part, I did manage to sneak outside and shoot this sunset over the lake. Apparently, this is the usual view at DL Bliss State Park. I thought it was the prettiest lake scenery I'd ever seen. Getting a campsite here is like winning the lottery, only harder. If you'd like to camp here, think ahead and mark you calendars because the rest of the world wants to camp here at the same time you do. 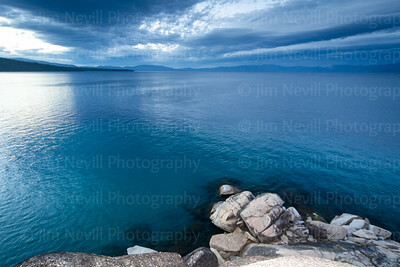 When I look at this photo I am awestruck by the deep, rich and diverse tones of Lake Tahoe. At first I skipped passed this image, thinking that without something definitive in the foreground it didn't work. reconsidered and now love the simplicity. Let the colors do the talking! 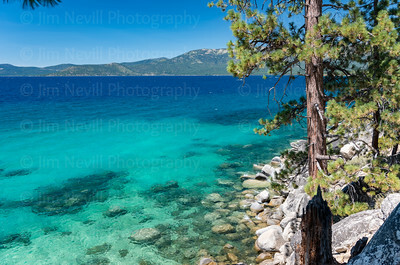 There are so many beautiful nooks on the Tahoe shoreline, especially on the Nevada side which is typically less accessible due to steep cliffs and limited parking. In summer 2018 I found this spot, a hidden gem of Tahoe beauty. In Summer 2018 there was a rather odd, super high lake level that in August was only a foot from flood levels. This is unusual because by mid-summer the lake has not been fed by rains for quite some time and the warm conditions increase lake evaporation effects. 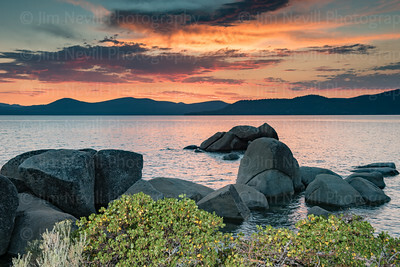 This spot is typically a white sandy beach but during the clear water high flood of summer it presented this cool opportunity to see these boulders partially submerged. 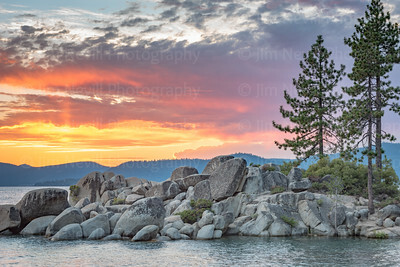 Sunset on the Tahoe shoreline never gets old. 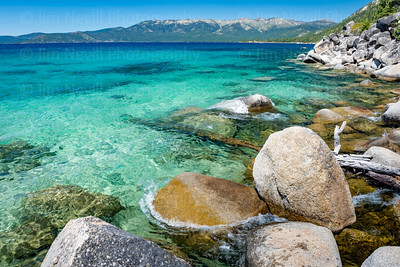 Sand Harbor is one of those magical places that despite its beauty I would typically avoid. I don't really like tourist traps, or scenic overlooks that everyone and their mother has photographed already. In peak season, Sand Harbor will see over 1,000 people per day. 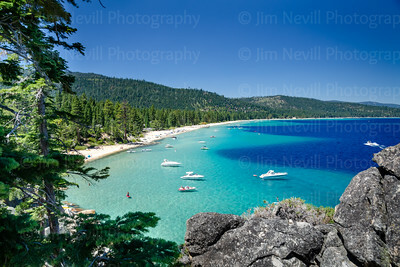 The east shore of Nevada is not really known for soft sandy beaches, except for Sand Harbor. 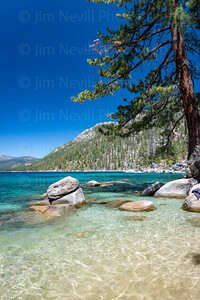 The majority of Nevada’s beaches have coarse sand which is tough on your feet, Tahoe’s prevailing breezes deposit white, fine-grained sand, at Sand Harbor. 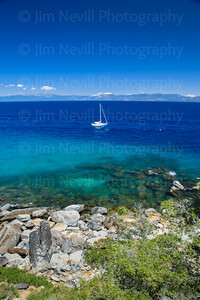 In Lake Tahoe there is endless eye candy, beauty and serenity. FInding unique perspectives and compositions is one of my favorite things to do, and on days when the cloud cover and vibrant colorful sunsets elude - discovery hidden 'gems' like this remind me to keep looking and discovering.